As 2018 comes to a close, I am sitting in a warm house, looking out at the sparkling snow, with much to be grateful for. A new job (which I love! ), new experiences (best of all, #DEN18), and so much growth, both personal and professional. I want to look back on my #OneWord2018 to guide my reflections. *Fair warning: This post is about me, and I feel a bit selfish writing it. But isn't that what personal reflections are? 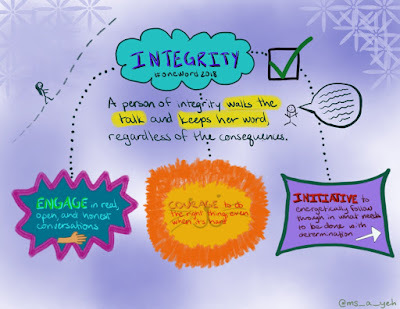 This year, I wanted to focus on integrity, with three components being engage(ing), courage, and initiative. This played out in many ways as through the year! In January, I was able to be spontaneous and engage with new friends as I took a trip to California to meet #PLN buddies in person! I also enjoyed a trip to string camp, in which I found & had the integrity to admit, for the first time, that I was happy to be in ed tech and moving on from my time teaching in the classroom. In February, I celebrated the culmination of my #OneWord2017 (LEAD) journey by summoning the courage to press "submit" on my PRAXIS (spoiler: I passed)! In March, I did a lot of reflecting, and took the initiative to really think about #selfcare as a part of being a healthy educator. In April, I earned my #GoogleET certification and blogged publicly, for the first time, about my desire to apply for the #GoogleEI program - it took courage to put it out there for accountability! In May, I wrote about continuing to learn and grow as an ed tech leader and engaged in "real talk" as I shared my first #GoogleEI application and thoughts along the way. In June, I wrote with integrity about my honest feelings about not getting into #LAX18, enjoyed seeing ways that music teachers were taking initiative to take ideas even further, and met SO MANY friends IRL at #ISTE2018! What a highlight that was, and a reminder of how special it is when we are ourselves - both online and in person - rather than wearing a mask or putting on a persona! In July, I engaged in some more honest sharing as I wrote about changes (having no idea what was coming in my own life) and took the initiative to not only attend another #EdTechTeam summit but convince my brother to present with me (which was amazing)! In August, I learned about taking a step back and allowing others to find the courage to lead and published one of my more popular posts of the year with the results of a survey about what people were looking for from ed tech specialists in schools that I took the initiative to put together. In September, a lot happened as I had the courage to put myself out there! I moderated my first Twitter chat, applied for #GoogleEI again (and got accepted this time! ), and started a new job. Talk about a big month! In October, I thought a lot about leading with integrity and what that meant in my new position - from the messages I was sending to the struggle with balance to the need for courageous choices & conversations. 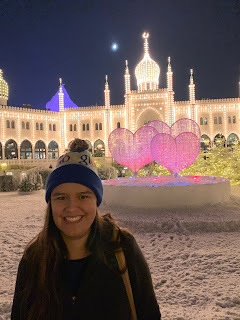 November wins the award for the most blogs written in a month, because I was at #DEN18 and blogged my way through! I made the decision after the first day of the academy to write vulnerably and engage in a real, raw way, which took courage and initiative. It ended up being a great experience that further fueled my desire to live with integrity and walk my talk of what I think is important! Which brings us to December, where I exercised that integrity by making sure I was living a life that demonstrated #selfcare, took the initiative to bring some fun to the office, and wrote about my struggles and lessons learned with listening to others. It's been a great year, and I truly see how my #OneWord2018 was woven in and out of my experiences! What will 2019 bring? Check back next week to see my #OneWord2019 and let's find out! Happy New Year, everyone! Say no to work (work-work or stuff that needs to be done). Say yes to fun and spontaneity. ...who are missing loved ones. ...who dread the days at home without the structure of school. ...who fear that they won't have presents this season. ...who do not find the holidays joyful. ...who are in pain (physical, emotional, spiritual). ...who need a reminder that they are loved. Take a minute and text someone, will you? Send them a chocolate bar. Stop by and say hi. Give them a hug. Send a little encouragement their way this holiday season. Let them know that they are not alone. As the busy holiday season continues, I'm determined to not forget a few #selfcare tips (remember #MyRelaxing5?). Today's installment: 3 ways to have some team-building office fun! 1. Get outside & take a walk! This one is super easy to implement. Find a buddy, and take a walk together! This gives you the chance to get some fresh air, to get some exercise, and to get to know each other in a little bit less formal setting. In Colorado, we are lucky enough to have sunny weather most days, but the temperature does vary quite a bit. Even when it's cold, put on your jackets/hats/gloves, and get out there! I know it feels hard to give up even 10-15 minutes of plan time (or work time), but I have found that I am so much more productive after giving my mind & body a break, and I wouldn't trade the conversations and relationships for anything! 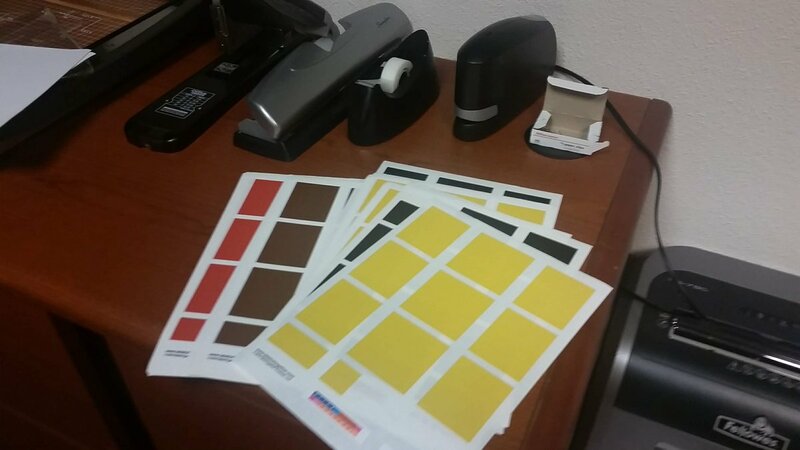 This activity was introduced to me by @zmidler, and has made an appearance in several school libraries! 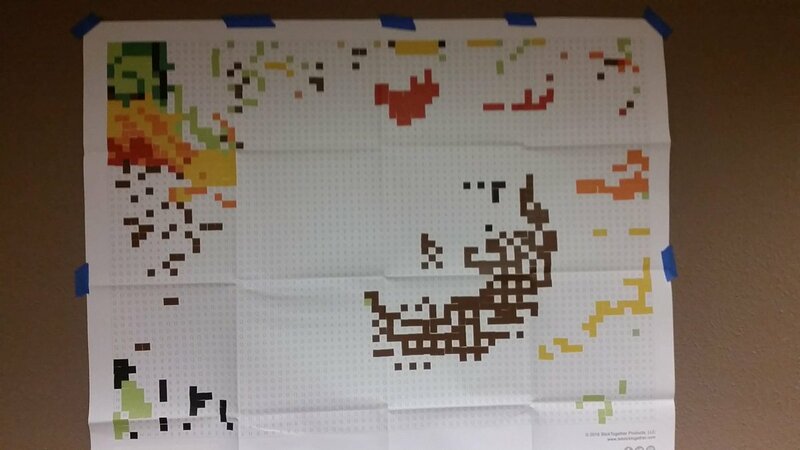 The basic idea is like paint-by-number, except with stickers - each little square (or pixel, so to speak) has a letter in it, and, using the key, you can put the thousands of different-colored little square stickers in the correct place. My favorite is pulling out the picture of the final product so you have to discover it as you go :-). The fun of this activity is that it brings people together to work on something collaboratively! It is a great brain break that can last for 30 seconds or 10 minutes (just depending on how many stickers you add to the final product). And lots of people can be working on it at once! This is another one I learned about from @zmidler - clearly, I like her ideas! 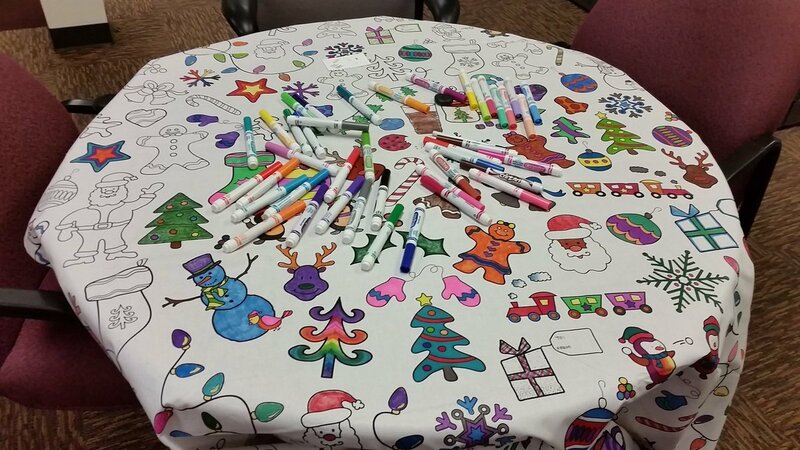 Put out a coloring tablecloth + a bunch of markers, and see what happens! Coloring is a great brain break, and a chance to express your creativity! Just like StickTogether, several people can be working on it at once, and we've noticed that when one person sits down to color, it often draws more people in to take a quick 5-10 minute brain break, and builds community that way! It's been interesting to see the progression of our coloring, as well. It started with being very concrete, and coloring in the lines, but as we get close to finishing it (and find ourselves coloring the same pictures at a different part of the tablecloth), people are branching out and being more creative in the way they use the markers to fill the space! As the resident director of Fine & Performing Arts, I love creative ways to bring people together - adults or students! What ideas do you have? Please share in the comments! True confession: I'm bad at it. Too often, I am thinking about how to share my views, rather than really listening to what others are saying. And it gets me into trouble at times! Switching places for a moment, it feels amazing when somebody is listening to you. Especially somebody with "power," somebody who can create change. I always feel so valued when people take the time to just listen! Often, I don't want or need a solution, but I want them to consider my viewpoint. I want to share (that's the human connection piece). I want to feel heard. Over the past several weeks, I've been in situations with students, parents, and staff members where I have to check my natural instinct to talk and focus on being a listener. It's hard! But I believe it holds the power to build relationships, and that makes it worth it! 1. "Tell me more about..."
Often, a pause in the conversation indicates an opportunity for the other person to respond. At times, though, there may be something that was left unsaid, and probing deeper brings us to the real heart of what is going on. Using that pause to say, "Tell me more" rather than "Here's what I think" often opens up a whole new level of understanding. Silence is uncomfortable. We tend to fill it with words. But sometimes those words distract from the heart of the issue. Don't be afraid to let silence sit in a conversation. Sometimes it leads to further reflection and revelation, but sometimes it just serves to acknowledge that you are hearing and thinking about what was just said. Oh, this is so hard! Especially in conversations that are more controversial, it is so tempting to want to stop someone when they are saying something that is hard to hear or not accurate (from your perspective). But what does that do? Immediately put them on the defensive. More often than not, it is worth it to let them finish their entire train of thought and look for the deeper heart of the issue, rather than quibbling over details in a back-and-forth ping-pong match. Even in conversations that are benign, it's easy to want to interrupt with my agreement, my story or experience, or my take on the matter. Hold your tongue & don't do it! How do you focus on being a good listener? Please share your tips & tricks in the comments below!